Sikh at Golden Temple The Sikhs are followers of the “Ten Gurus” (from Guru Nanak to Guru Gobind Singh) who preached monotheism, tenets found in both Islam and Hinduism, encouraged mediation and rejected the Hindu caste system. The Sikh religion (Sikhism) began in the 15th century with Guru Nanak. The word “sikh” is derived from the Sanskrit word shishya which means "disciple." In Punjabi Sikh means “learner.” Sikhs in India used the terms sikhy (“disciplineship”) and gurmat (“Guru’s doctrine”) o describe their religion. There are about 20 million Sikhs in the world today. About 85 percent of them are in India, where they make up about three percent of population. About 95 percent of the Sikhs in India live in the Punjab, where they make up about 75 percent of population. They also live in communities scattered around India and around the world, primarily in the United States, Britain and former British colonies. The Punjab remains the homeland of the Sikhs. Sikhs call their homeland Khalistan. 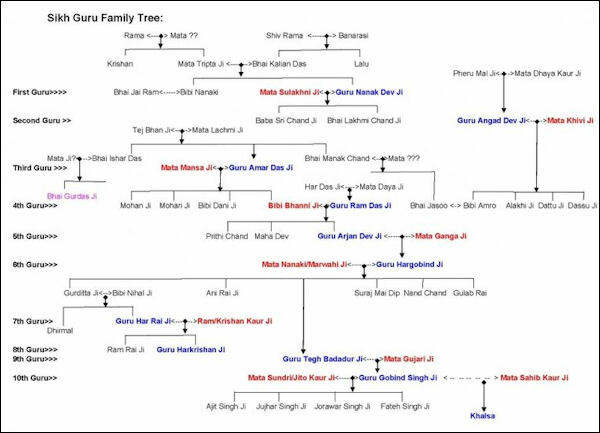 Nearly all Sikhs are descendants of ancestors that were originally Hindus rather than Muslims. Many are Jats (a farming people that have a history of standing up to persecution). Until the Indian government invasion of the Golden Temple in 1984 many Sikhs didn’t even regard themselves as belonging to a distinct religious community. Punjabi culture and Sikh culture are interwoven. See Punjab or Anything related to the Punjab. Guru Nanak with Hindu holymen Guru Nanak (1469-1539) is credited with founding the Sikh religion in an attempt to come up with a religion that harmonized Islam and Hinduism and contained the good points of each religion but not their inequalities. The precocious son of farmers, Nanak was born in Talwandi, a Punjabi village in what is now in Pakistan, 30 miles southwest of Lahore, and grew up at a time when rivalry between Hindus and Muslims was common, the Mogul Empire was emerging and various Hindu movement were advocating a love of god that transcended religious conflict. Guru Nanak was a khatri, a largely mercantile caste within the kshatriya caste. As a child he showed no interest in religion. He married at the age of 12 and worked as an accountant for the sultan of Delhi. He had two sons, and at age forty-five became a religious teacher. At the age of 30 he was deeply moved by an experience with God, while bathing in the Bein River.During the experience Guru Nanak said he was given a cup of sweetened, sacred water called amrit (literally “undying,” the nectar of immortality) and told by God: “Nanak, this is the cup of Devotion of the Name: drink this...I am with you, and I bless you and exalt you. Whoever remembers you will receive my blessing. Go, rejoice in my name and tell others to do the same. I am bestowing on you the gift of my Name. Let this be you vocation.” After meditating for three days Nanak gave away all of his possessions and announced there are “no Hindus and no Muslims, so whose path shall I follow? I shall follow the path of God," implying there was only one true god and he accepted all people. Nanak formed a community made up mainly of farmers, artisans and traders in Kartapur in present-day Pakistan that empathized devotion and meditation not rituals. He spent his days bathing in the morning, followed by worship, and enjoyed a communal meal in the evening. Although Nanak frowned upon stories of miracles many stories grew up about miracles he performed such as bringing to life a dead tree and squeezing blood from a rich man’s food. Nanak He composed 974 hymns, mainly aimed at expressing the name of God, which became the basis of the Sikh holy book, the Guru Granth. Nanak's son, Baba Sri Chand, founded the Udasi sect of celibate ascetics, which continued in the 1990s. However, Nanak chose as his successor not his son but Angad (1504-52), his chief disciple, to carry on the work as the second guru. 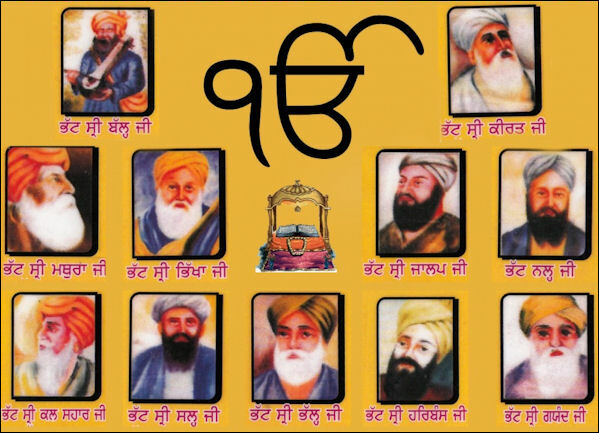 Thus began a lineage of teachers that lasted until 1708 and amounted to ten gurus in the Sikh tradition, each of whom is viewed as an enlightened master who propounded directly the word of God. The third guru, Amar Das (1479-1574), established missionary centers to spread the message and was so well respected that the Mughal emperor Akbar visited him ( The Mughals). Amar Das appointed his son-in-law Ram Das (1534-81) to succeed him, establishing a hereditary succession for the position of guru. He also built a tank for water at Amritsar in Punjab, which, after his death, became the holiest center of Sikhism. The Ten Sikh Gurus are more than just “spiritual counselors,” the traditional definition of gurus; they are Sat Gurus, “true teachers” who reveal God’s teachings. Their succession has been compared to the transfer of a flame from one spiritual unifier to another. Guru Arjun Dev being pronounced fifth guru By the late sixteenth century, the influence of the Sikh religion on Punjabi society was coming to the notice of political authorities. Ram Das (1534-1581) was the forth Sikh guru. He founded the city of Armistar, which was built on land given by the Mogul emperor Akbar. The fifth guru, Guri Arjun, was Ram Das’s son. He assembled the Guru Granth, built the original Golden Temple and was tortured and killed in Lahore by the Moghul Emperor Jahangir in 1606 for alleged complicity in a rebellion. He was an acclaimed poet like Guru Nanak. In response to Ram Das's execution the next guru, Hargobind (d. 1644), militarized and politicized his position and fought three battles with Mughal forces. 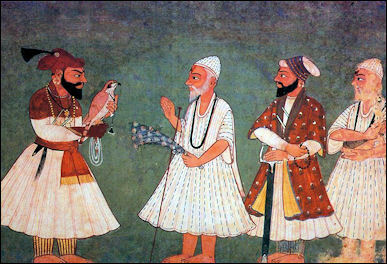 The eighth guru, Guru Hara Krishan died at the age of eight of smallpox and is know best for refusing to meet with the Mogul Emperor Aurangzeb,The ninth guru, Tegh Bahadur (1621-75), because he refused Mughal emperor Aurangzeb's order to convert to Islam, was brought to Delhi and beheaded on a site that later became an important gurdwara (abode of the guru, a Sikh temple) on Chandni Chauk, one of the old city's main thoroughfares. As Sikhism developed it attracted members of various tribes and castes, including large numbers of Jats, a farming people that have a history of standing up to persecution. By early in the 17th century that religion had attracted so many followers that it was viewed as a threat by the Mogul rulers, who persecuted Sikhs, which in turn encouraged Sikhs to take up arms and resist their oppressors. 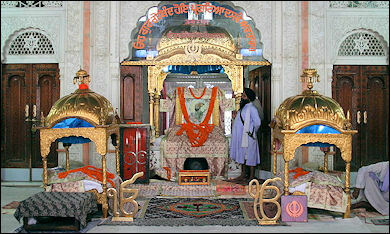 Guru Gobind Birthplace Guru Gobind Singh (1666-1708) was the tenth and last Guru. He is regarded as the second most important guru after Guru Nanak.. He became guru after his father, the Ninth Guru Tegh Bahadur was beheaded for refusing to convert to Islam. Four of Guru Gobind Singh’s sons died fighting for Sikh rights. One was killed in a battle against the Moguls. Another was bricked up alive in wall for refusing to renounce his faith. Gobind Singh himself died a few days after being struck by an assassins arrow. Guru Nunak was a pacifist. Guru Gobind Singh responded to Mogul oppression by transforming the Sikhs into a unit of fighters and a militant brotherhood dedicated to defense of their faith at all times, ready to challenge Mogul rulers and the Hindu caste system. He glorified martyrs who he said “attain glory both here and hereafter” and instituted a baptism ceremony involving the immersion of a sword in sugared water that initiates Sikhs into the Khalsa (khalsa , from the Persian term for "the king's own," often taken to mean army of the pure) of dedicated devotion. Guru Gobind Singh is responsible for the "Five Ks" and the turbaned appearance of Sikh males. He introduced the custom of carrying a large curved dagger in a silver sheath, wearing a turban, carrying a comb and never cutting the hair or beard. In 1699 by he founded a militant fraternity called Khalsa (meaning "pure" or “God elect”). He assembled five trusted lieutenants (called panj piyarey, the five beloved ones") in Anandpur Sahib ("town of bliss") to energize Sikhism in the face of Muslim invasions. Under Guru Gobind Singh military and political doctrine became very important to the Sikhs. The Khalsa brotherhood merged "religious, military and social duties” into “a single discipline." The Sikhs have a tradition of being both militarily trained and militarily prepared. This tradition helps explains how the religion has survived intense persecution and why Sikhs recruited by the Indian, Pakistani and British militaries. 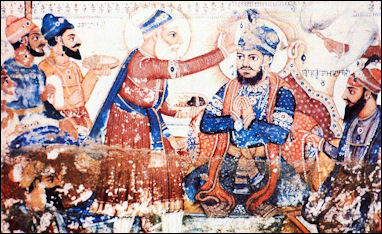 The Sikh monarchy established after Nanak's death lasted until shortly after the death of the Tenth Guru, Gobind Singh. In the tumultuous 18th century, the Sikh kingdom dissolved into several feudal states and the Sikhs became a confederation of warrior tribes. By the mid 18th century, Sikh guerillas challenged the Mogul overlords and contributed to the collapse of Moghul administration in the Punjab. They also helped keep Afghan invaders out when they invaded India between 1747 and 1769. One of the most famous Sikh heros was Baba Deep Singh. During a battle to save the Golden Temple from desecration he reportedly had his head cut off but kept right on fighting with a sword in one hand and his head in the other. Maharajah Ranjit Singh, the "Lion of Punjab," ruled over all of the Punjab from Lahore in the early 19th century. He emerged as leader at the end of the 18th century and remained the Sikh leader until his death in 1839. After he died the political side of Sikhism fell into decline. The last Sikh king, Maharajah Dhulip Singh, adopted Christianity and gave the largest diamond in the world at that time, the Koh-i-nur, to Queen Victoria. The British viewed the Sikhs as a martial race and actively recruited them beginning in the mid 19th century for their military forces in India. Sikhs also served in the British military abroad. The exposure of these Sikh soldiers to the outside world launched the first waves of Sikh emigration, to Britain and to British colonies in Malaysia, Burma, Africa and other places. Revivalist movements of the late nineteenth century centered on the activities of the Singh Sabha (Assembly of Lions), who successfully moved much of the Sikh community toward their own ritual systems and away from Hindu customs, and culminated in the Akali (eternal) mass movement in the 1920s to take control of gurdwaras away from Hindu managers and invest it in an organization representing the Sikhs. The result was passage of the Sikh Gurdwara Act of 1925, which established the Central Gurdwara Management Committee to manage all Sikh shrines in Punjab, Haryana, and Himachal Pradesh through an assembly of elected Sikhs. The combined revenues of hundreds of shrines, which collected regular contributions and income from endowments, gave the committee a large operating budget and considerable authority over the religious life of the community. A simultaneous process led to the Akali Dal (Eternal Party), a political organization that originally coordinated nonviolent agitations to gain control over gurdwaras , then participated in the independence struggle, and since 1947 has competed for control over the Punjab state government. The ideology of the Akali Dal is simple--single-minded devotion to the guru and preservation of the Sikh faith through political power--and the party has served to mobilize a majority of Sikhs in Punjab around issues that stress Sikh separatism. Leaders of sects and sectarian training institutions may feel free to issue their own orders. When these orders are combined with the prestige and power of the Central Gurdwara Management Committee and the Akali Dal, which have explicitly narrow administrative goals and are often faction-ridden, a mixture of images and authority emerges that often leaves the religion as a whole without clear leadership. Thus it became possible for Sant Jarnail Singh Bhindranwale, head of a training institution, to stand forth as a leading authority on the direction of Sikhism; initiate reforms of personal morality; participate in the persecution of Nirankaris; and take effective control of the holiest Sikh shrine, the Golden Temple in Amritsar, Punjab, in the early 1980s. His takeover of the Golden Temple led to a violent siege and culminated in the devastation of the shrine by the army in 1984. Later terrorist activities in Punjab, carried out in the name of Sikhism, were performed by a wide range of organizations claiming to represent an authoritative vision of the nature and direction of the community as a whole. 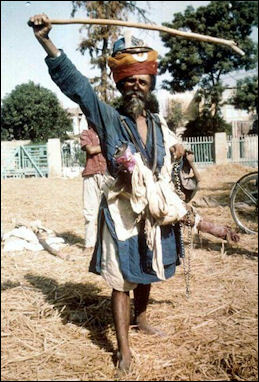 The partition of India and Pakistan after World War II made Sikhs the majority in rural areas of central Indian Punjab. Before partition in 1947 Sikhs made up only 13 percent of undivided Punjab in what is now Pakistan and India. After partition most of the Muslims left in Indian Punjab fled to Pakistan and many of the Hindus living in Pakistani Punjab moved somewhere else in India other than Indian Punjab, while Sikhs in Pakistani Punjab fled to Indian Punjab, creating the huge concentrations of Sikhs there that remain there to this day. Sikh groups known as Singh Sabhas emerged in the late 1800s. Emphasizing their differences from South Hindus in matters of theology, rituals, social customs and politics, they led a nonviolent campaign in the early 1920s that gave the Sikhs control over Sikh temples that had formally been managed by Hindus. Since 1925, the Sikh Gurdwara Protection Committee---which emerged from the Singh Sabhas movement--- has overseen Sikh shrines and played a prominent role in Sikh politics. Frustrations over discrimination led to the creation of a Sikh militancy in the 1970s that demanded a separate Sikh state. The government didn’t want the Punjab---the breadbasket of India--- to break away from India.. Using a argument similar to that used later in Kashmir, the Indian government argued that if the Sikhs were allowed to have their own state then other ethnic and religious groups would also want autonomy, potentially fracturing India into a bunch of small states like the Balkans. The leader of the Sikh separatist movement was Jarnail Singh Bhindranwale, a charismatic preacher who wore a blue turban tied in the old tradition way, had powerful hands, a droopy left eyelid and crooked yellowish teeth. He often carried a arrow in his hand which symbolized his religious authority. During his inflammatory and virulent speeches, he accused Hindus of injustice and described how police tortured Sikhs by cutting open their legs and pouring salt in their wounds. He demanded that Punjab be made a Sikh state called Khalistan. It was hard to imagine this happening since the Punjab grew two thirds of India's grain. Bhindranwale first made a name for himself when he led a procession and one of his followers cut off the arm of Hindu shopkeeper. A battle between Sikhs broke out that left 12 Orthodox Sikhs and three reformed Sikhs dead . Photographs of the dead, some with their faces shot away, were adorned with marigolds and put on display, and their deaths were blamed on Hindus. Problems between Sikhs and the Indian government escalated in the small village of Dheru in 1981 when two Bhindranwale followers, who were also fugitives, were cornered by authorities and escaped after shooting two policemen dead. Later Bhindranwale was arrested after a gun battle for his involvement with the murder of the police. That same day three Sikhs on motorcycles shot into a crowd of Hindu's, killing four. In May 1984 Indian army infantrymen attacked the Golden Temple when more than a thousand of pilgrims and militants were inside. Indian soldiers and Sikh militants exchanged mortar and machine gun fire. Seven Indian tanks shelled the temple’s three story tower where Bhindranwale was thought to be hiding out. When the fighting stopped the Golden Temple was in ruins. Between five hundred and two thousands civilians, Sikh militants and Indian soldiers were killed and many of the Sikh's holiest scriptures, some handwritten by the ten Gurus themselves, had been reduced to ashes. Bhindranwale was found dead with one eye open and one eye closed. The conflict between Sikhs and the Indian government left thousands of Punjabis dead. mostly in the late 1980s. After the raid on the Golden Temple, violence escalated. Sikh separatists blew up crowded trains and school buses, stage terrorist attacks and attacked Punjabi Hindus. They received some funding from Sikhs living abroad. The Indian leader Indira Gandhi tried to divide the Sikh separatists by supporting one militant faction in a political battle with another. Temple in 1973 In 1984, two Sikhs that were trusted bodyguards assassinated Prime Minister Indira Gandhi. Thousands of Sikhs were killed in riots that followed the assassination. The bodyguards apparently committed the murder in revenge for the assault on the Golden temple in Amritsar which had taken place five months before. They were reportedly given a "black warrant," or execution order, by Sikh militant leaders.